Hi friends. Unfortunately I don't have an outfit post to share today, as I'm still in the hospital with my son Tyler. If you read last weeks post, then you already know that Tyler was admitted to Children's Hospital for a bacterial infection. He was having stomach pains and bowl problems for almost six weeks, and because it took us longer than it should have to figure out what was causing them, he had became anemic and dehydrated, landing him in the hospital. I was initially told that we would only be admitted for two to three days while he was given an IV, and his first few doses of medicine. However, after a week of taking his antibiotic, there wasn't much improvement in his condition, so the doctors decided a colonoscopy was needed. Yesterday, we got the results from the colonoscopy and discovered that the reason he wasn't healing (and how he ended up with the infection in the first place), was because he has ulcerative colitis. Colitis is an Inflammatory Bowel Diseases (IBD) that affects the large intestine, or colon. There is no cure for colitis, however it is treatable, and can be maintained with the right medicines and diet. 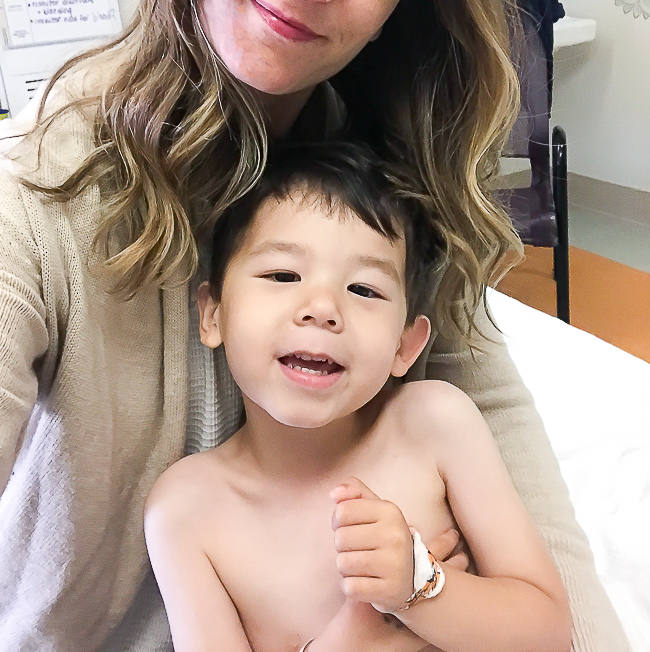 Although no mother ever wants to hear that her child has a chronic condition, there's a bit of relief in finally knowing why he has been so sick, and now we can begin treatment. Tyler has now been on medicine for the colitis for 24 hours, and is already showing tremendous improvement! We just need to make sure that his blood count levels are back to normal, and that he can go without being dehydrated when not on an IV before we are released from the hospital. I have high hopes that we will be home this weekend. I've been staying with Tyler at the hospital, and have only been home a couple of times to shower (thank goodness for dry shampoo) and do some laundry. So lets just say that I haven't been the most fashionable person these past 10 days, or have had time to take blog photos. 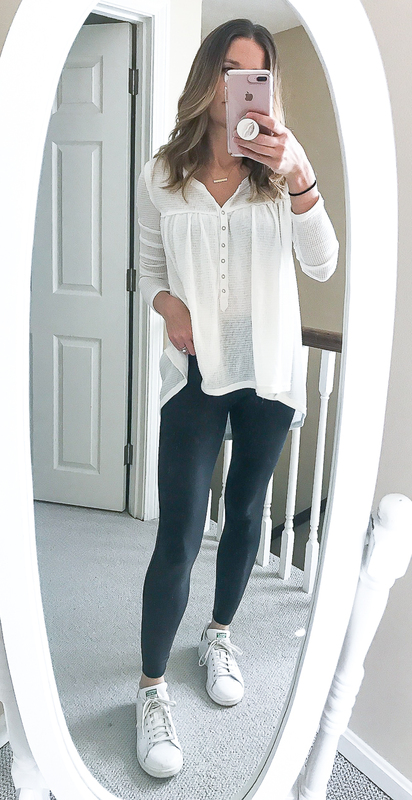 I am sharing the outfit that I've basically been living in this past week (below), and praying that we get home to our own beds this weekend. I'll be back with outfit posts soon! The feature blogger is Bo's Bodacious Blog. I'm in love with her tie front shorts. So cute for the summer! She's styling them two ways, so make sure to visit her blog to see the second look, and to say hello! I am so sorry to hear about your son but so glad you have a path forward. Sending prayers your way. How scary for you to have your son in hospital so long, but it's good you know the reason now and he's on the right treatment. I have a friend with colitis and they find it manageable so I hope you do too once you get used to it. I'm so sorry, I hope Tyler gets to go home soon. Poor baby, keeping you guys in my thoughts. So sorry it's been such a rough week but am glad they have found the root of the cause. Hoping you get home soon and keeping you in my thoughts. I'm so sorry to hear that about your son! Hope everything is better soon! I'm so sorry to hear about what you've been going through with your son. These must have been some very stressful weeks. Glad you at least know what's going on now so it can be addressed and so glad he's doing better. Oh, I'm so sorry to hear about your son. That must have been terrifying not knowing what was wrong. Glad you finally got a diagnosis and he's doing better. Love your casual outfit. I'm so sorry to hear about your son! It's times like these that make you realize what is important and that's not our appearance, but spending time with those we love. Hope he recovers quickly! Oh sweet Tyler and sweet mommy! No one cares all that much about outfit posts when a baby is sick. I am glad to hear that you have finally identified the issue and can properly treat him. He will be back to his energetic little self soon and you will be back to being able to breathe again. Sending lots of hugs and positive thoughts your way! I'm so sorry to hear! That must have been wrote a few stressful weeks! I hope you can have finally a bit of a relaxed weekend and pray for you that Tyler is coming home soon! Oh Rachel, sending light and love to you and your son. I'm glad he's on the road to recovery, and I hope you get to go home soon! Oh gosh, I am SO glad you finally got some answers. I am sure you are relieved in that, even though it is something chronic and will need to be managed the rest of his life. But, it sounds like they have a good treatment program for him to follow so he can feel better! I am sure the poor boy felt horrible for the past 6 weeks! I'm glad you got him the care he needed, you get momma gold stars for that! I'm so sorry to hear about your little one. :( Sending prayers your way so that you are home soon! It's good to know your son is getting the right treatment now dear. Hope he gets better soon. I'm so sorry to hear about everything you and your son have been going through! I am glad they figured out the cause and treatment is working! Hope you are both home by now! I am so sorry about your son! As a mom, this is always a scary experience! I hope he gets better soon! I hope you and your sweet family are doing well! I know it's so stressful and worrying to have a little one not feeling well! I'm glad you got some answers and hope he's starting to feel better now!